Cherkazoo And Other Stories - 1992 - R.P.M. Gillan is the solo act of former and future and concurrent Deep Purple front man Ian Gillan. After getting his marching orders from Deep Purple Gillan set about forming his own band. Gillan played to big crowds around the world and played the Reading Rock Festival. Gillan was asked to join his former Deep Purpler in Rainbow, but with the act doing quite well Gillan thankfully refused. McCoy and his band were previously signed to Purple Records and supported Deep Purple circa 1971. Janick Gers joined the act for Double Trouble, as a replacement for Torme, and the band toured some more. At this point, Gillan was struck with illness and lost his voice just prior to another tour. The band split and Gillan was next to join Black Sabbath. Different compilations and live albums of Gillan pop up periodically to this day. Live At The BBC 79/80 is a double CD set. Mick Underwood and Gillan attended school together. Gillan and McCoy have maintained a mutual dislike since the latter's departure from the band. McCoy later released music under the The Gillan Tapes monicker which featured rare and unreleased material. Ian Gillan had a new DVD in 2005 in order to celebrate his 40th year in rock music. The Gillan's Inn album, marking Gillan's 40th musical anniversary, was available in DualDisc format featuring a CD on one side and DVD on the other. The discs were issued a year later as a Deluxe tour Edition with three bonus tracks. 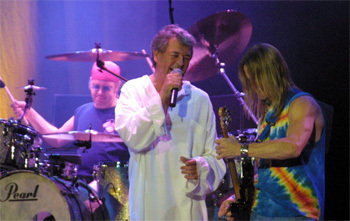 Ian Gillan's Australian tour was cancelled in late 2006 in order to allow for the healing of bassist Rodney Appleby following the shooting which left bullet fragments in his neck. The Demon/Edsel labels released a box set of all eleven singles by the band in CD-sized replicas of the original 7" sleeves. The box also included a bonus DVD of seven promotional videos. Edel issued Live In Anaheim, a two-CD package in February of 2008, which was recorded live at House Of Blues in Anaheim, California at the end of 2006. Ian Gillan’s newest album, One Eye To Morocco, was out in March, 2009 through Eagle Rock. WhoCares was the name of the two-disc 2012 miscellaneous recordings pulled from the joint works of Deep Purple's Ian Gillan and Black Sabbath's Tony Iommi. The much-touted CD/DVD from Ian Gillan of solo and Deep Purple fame is a special release. The package is unique not only due the substantial amount of audio, video and still shots on the disc, but also due to the nature of the jam - for indeed Gillan's Inn is a big jam session - featuring the likes of Ian himself, Ronnie James Dio, Joe Satriani, Jon Lord and Ian Paice, Uli Jon Roth and Michael Lee Jackson. The star of the show, of course, is the jovial Gillan who dances plus sings, screams and screeches like a bird on songs like Bluesy Blue Sea, Smoke On The Water, Speed King, Trashed, etc. Boy, does he let loose. It is perhaps the format that captures the mood for the personalities shine through. The fun, bootleg shows, performance and much commentary and raw footage are all there, although somehow more live concert and other older Gillan footage would have seen appropriate. No matter, for that wasn't part of the gig here, Gillan throws himself a hell of 40th anniversary extended trophy party. Gillan and Deep Purple fans will find this hoot a howl and to think that Gillan told me that putting it all together was in fact quite easy. The disc is loads of fun and, agreeably, weighed by the incredible respective musicianships. - Ali "The Metallian"
METALLIAN: Ian, thank you for your time. How is everything going today? GILLAN: No worries, mate. I am staring at the sunset and the wonderful Helen Mirren. She is on a billboard across the road. She is my favourite actress, now that Shelley Winters has passed on. METALLIAN: Let's chat a little about your dual-disc, Gillan's Inn. Who came up with the title? GILLAN: That wasn't too difficult to come up with because I have a pub sign that says Gillan's Inn that my manager bought me 20 years ago. It has been hanging in my poolroom all that time so when we decided to remake a bunch of songs in a big jam session we thought a pub would be appropriate. When we started playing music in England every pub had a back room, a function room, and you would be able to play in what they called blues clubs. There were always 50 people there. So the name is very appropriate. METALLIAN: How much work was it to round up the personalities and the talent who appear on the release? You have quite an ensemble there. GILLAN: You know, there was not one single element of this record that was hard work. It was all too easy. I made a few telephone calls and sent out e-mails and got a fantastic response. The first one back was Joe Elliott. He replied within 20 minutes saying "count me in, mate. I am there." It is an interesting project. If someone had invited me to something like this I would have accepted immediately. There was no arrangement and new writing to do. You get to play with people you never get the chance to play with again. For example, when Tony Iommi sent me an e-mail I was thinking we haven't decided which material we are going to do - which songs. I thought I got to do the song Trashed. I put him together with Ian Paice and Roger Glover. Can you imagine? But it was not difficult. It was pure fun. METALLIAN: Your name also carries a cachet, which probably reassures people that the project will be suitable and fun. GILLAN: Actually, that is an interesting question. I hadn't thought of that. Yes, I think if you cut out all the business people the musicians trust each other. They have to because when you are on stage that's all that exists. You rely on musicians when you are working all the time. The only problems that really exist are on the business side. They don't have anything to do with the music. METALLIAN: As a singer yourself why would you bring in others singers like Joe Elliott or Ronnie James Dio? GILLAN: They are really good friends of mine and, it wasn't just that, Cliff Bennet	is probably the best singer on the record”¦ but I talked to Joe and asked him if he remembered the night we got locked in a pub in Dublin? It was quite an amazing evening. We were singing just to the landlord and his family in return for a few pints of Guinness! As part if the evening we went through the entire Everly Brothers' catalogue so when he was singing I asked him to 'Everly' it up a bit. It was just singers... I don't see singers as a threat. I have always looked up to Ronnie. GILLAN: Well, it's quite difficult because he is so short (laughs). METALLIAN: Speaking of singers, who is your favourite singer of all time? GILLAN: A young Elvis Presley was the greatest singer who ever lived in history of time. I am not alone in thinking this. Kiri Te Kanawa, the New Zealand opera singer and soprano, was asked this question and replied in the exactly same way. The young Elvis had an unbelievable voice. I am not talking about the fat guy who ended up in Las Vegas. I am talking about a young man who walked into Sun Studio with Sam Phillips. That was the person who had the greatest voice in the history of mankind. METALLIAN: Going back to Gillan's Inn, who, if anyone, did you want on the disc, but couldn't get? There must have been a couple of names, at least. GILLAN: There was only one. That was Brian May of Queen. He was busy working on the new Queen project with Paul Rodgers at the same time. He sent me a very nice letter saying, "I can't make it. I just can't because I am so busy." By that time we had more than enough people anyway. That is how we ended up with so many different versions of Smoke On The Water. METALLIAN: One thing that surprised me was the lack of material from your solo bands, Gillan and Ian Gillan band. GILLAN: I get you. First of all, I didn't want any complicated arrangements because it was going to be a jam session. It was supposed to be as if everyone walks into a pub, gets up on stage and plays a couple of songs and so on. I wanted two songs from the early period; from before I started writing which is why we have the Bob Dylan and the Marvin Gaye songs on there. The rest is a direct proportional representation of my career. We recorded A Day Late And A Dollar Short, Bluesy Blue Sea, Sugar Plum and Hang Me Out To Dry, et cetra are on the disc. When I looked back at songs I didn't even consider where they came from. We just put up a list of 400 songs and those are the ones that made it. I have written 400 songs! I have got another twenty or thirty in various stages of completion at the moment. I am in the pre-planning stages of my next album. I am also in the middle of a Deep Purple tour after which there will be a Purple album as well. I have to squeeze my own album in before we finish the tour. I will probably have to give them food poisoning or something to finish my album (laughs). METALLIAN: Ian, on the business end of things it has been a pleasant surprise how much promotion Gillan's Inn is getting. GILLAN: Yes, it is refreshing. METALLIAN: The promotion behind recent Deep Purple albums has been disappointing in contrast. GILLAN: I think it has to do with the general lethargy towards 'classic rock acts,' as they call them, in the business. They just don't get the live thing. Deep Purple is playing to 10,000 eighteen-year-old kids a night. I think the industry has become lethargic towards any band that is over 25-years old. It is very difficult. Fortunately, I have a fantastic record company and they seem to have kick-started a renewal of interest in me. I am very grateful to them. We are all vibrant musicians in Purple. It is a wonderful family and it is my priority at the moment, but I don't know why this has happened. This promotional effort has taken me by surprise too. METALLIAN: Ian, we have to talk about your voice. Forty years later, how do you keep your voice intact and in shape? GILLAN: Erm... I do nothing! Absolutely nothing. I embrace life and I do enjoy a long walk and a good swim, but that is about it. I don't do anything really. I think it's a state of mind. I probably keep myself fairly level spiritually. Nothing special apart from that! METALLIAN: In the urban legends department it has been rumoured for years that in the midst of your performance of Child In Time in Japan during the recording available on the Made In Japan album a man pulled a gun and committed suicide. How about a definitive yay or nay to this rumour? METALLIAN: Elsewhere, how is your relationship with Ritchie Blackmore these days? Are you in touch with him these days? GILLAN: We grew apart. Let's leave it at this. I have great respect for Ritchie. He was a wonderful guitar player. He contributed an enormous amount to my life and to Deep Purple particularly. We got divorced. The day Ritchie Blackmore left Deep Purple was the day Deep Purple survived. We were about to die. He left and the sun came out. We now lead a fantastic existence. We all wish him well and we all hope he is happy. Ritchie did not care about Deep Purple. He cared about Ritchie. We all cared about Deep Purple. It is a family and the family has survived. It is a very healthy and prolific family right now. We are all enjoying it and putting in a lot of practice. The response indicates that everything is alright. METALLIAN: Finally, Ian, what other news can you relay to the readers at this point? GILLAN: Deep Purple is a priority. I am eight weeks into a two-year tour with Deep Purple right now. That is taking up my prime time. When I get days off I am working on the new Gillan album. Later in the year I have a new book coming out. The book is just for fun. As I like to say, it is a coffee table book with material from my website. As I say in the foreword, it is for people with coffee tables and especially if their floor is uneven! A month after that we also have a documentary coming out, which we have been working on. Then the Gillan albums will be remastered and will come out on the BBC-affiliated Demon label. Those will be properly promoted as well. That is exciting to me. Gillan's Inn is out and about. For more news on the man check out his website at www.gillan.com.